Image caption One bookshop owner said the scheme would be like "inviting hungry foxes into the henhouse"
Bookshop owners have hit back at an initiative by Amazon to sell its Kindle e-book reader in independent shops. The Amazon Source programme, launching first in the US, would let bookshops sell the devices and receive a small cut of e-book sales thereafter. But reaction has been hostile - one US bookseller described it as "inviting hungry foxes into the henhouse". Amazon said bookshops "should be striving to offer customers what they want". Announcing the initiative earlier this week the company said: "With Amazon Source, customers don't have to choose between e-books and their favourite neighbourhood bookstore - they can have both." However, it appeared bookshop owners were not convinced. New York-based publisher Melville House gathered opinions, and posted the frosty responses on its website. "Hmmm, let's see," wrote Carole Horne from Harvard Book Store in Massachusetts. "We sell Kindles for essentially no profit, the new Kindle customer is in our store where they can browse and discover books, the new Kindle customer can then check the price on Amazon and order the e-book. "We make a little on their e-book purchases, but then lose them as a customer completely after two years. Doesn't sound like such a great partnership to me." 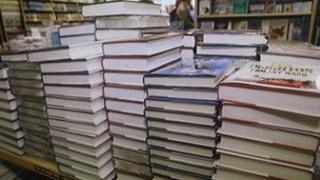 Staff at Skylight Books in California said it was "a Trojan Horse-style attempt to gain access to our customers". Amazon has not yet announced whether it has plans to extend the scheme to the UK. However, retailer Waterstones began selling the Kindle device in its stores earlier this year, despite managing director James Daunt previously describing Amazon as a "ruthless, money-making devil". Mr Daunt admitted that readers were migrating to digital platforms, but that it was beyond the company's capabilities to develop and manufacture its own device. But whether independent bookshops will welcome the same logic is as yet unclear. The resentment stateside was welcomed by Patrick Neale, president of the Booksellers Association and co-owner of Jaffe & Neale bookshop and cafe in Chipping Norton, Oxfordshire. "I was really pleased to see that American independent bookshops were saying no thanks," he told the BBC. "We've stopped and thought about it because we're business people. But you've got to draw a line in the sand somewhere - they are destroying the high street. "To do anything in collaboration would be wrong to our customers - it would be a very confusing message." He added that a more favourable e-book deal for bookshops would be directly with publishers, with various discussions of that nature currently taking place. Mr Neale's view was shared by Fran Crumpton, company manager at the Book Partnership, a group that helps independent bookshops set up online operations. She too believed most bookshops would be opposed to the deal. "Why should they be selling Amazon's products? That will then stop people using their bookshops - and we are losing so many. That's what many bookshops are thinking."